One of the most iconic cars in the world, in terms of people knowing what to expect when you name it, is the limousine Perth. Yes, people imagine the stretch model which isn’t representative of all limos, but the fact that it brings up a mental image says volumes. Now, take one of the other most iconic cars to hit the road, the hummer. This one is a little less popular, if only because they haven’t had as much time to seep into the popular consciousness. However, for the folks who recognize it, it’s not less iconic a car. Which brings us to the hummer limo, the combination of the two. Ideally, it brings an interesting mix of the best parts of both ideas. A professional chauffeur service from the limousine side, along with the many luxuries associated with it. From the other side, you get the rugged presence and design of the hummer. However, did you know that all hummer limousines aren’t mass-produced? They use a hummer as the frame, but all of them are customized and modified. The frame is used because it provides a distinct, exotic appearance. There are a few ways to mistake a hummer on the road as anything but what it is. This is true no matter what colour it comes in. Now, if you’re looking for a hummer limo, you should know there are actually two types used as the base body. One of them is the H2, and the other is the H3. 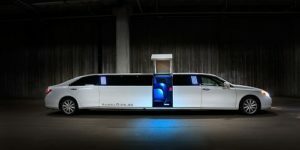 The H2 model can be modified to become a stretch limo, seating up to 24 people. In most cases, an H2 limo will have a number of amenities built into it. A full bar is standard, along with mirrored ceilings and a dance floor. Lighting will usually mimic club setups, so that’s neon and strobe lights. The interior space is also big enough that you can party inside. The other model is the H3, which is smaller in most cases. Up to 14 passengers only, most of the time. The interior boasts wrap-around seating and TVs, so it’s meant for a more relaxed time. The awesome sound system can be great for a more intimate or personal party, however. It also has a bar setup and most will use fibre optic lighting.